Shakespeare and The Walking Dead- Words, Words, Words! I pulled out an older post, as it may be a timely subject. Did you know Friday September 20th, PBS is going to air the British mini-series The Hollow Crown? The series is an ambitious production of all of Shakespeare’s most fascinating history plays; Richard II, Henry IV, Part 1, Henry IV, Part 2 and Henry V. Shakespeare fans should not miss this! This last week we watched as President Obama used threatening words towards Syria much as Henry threatened the mayor of a small French village, (see quote below). Henry’s threats compels the mayor into action, or to be exact, nonaction. The mayor allows Henry to take the village. Obama’s words may end up having similar effects on Syria. No, the civil war will not end, but hopefully the gassing will. As you watch the Hollow Crown, listen to the words words words! Some of Shakespeare’s most powerful speeches are found in these four plays. I don’t know about you, but I’m a huge fan of the AMC show The Walking Dead. I like it for a variety of reasons, the biggest being my fascination with how people would deal with life in a dystopian world. How they adapt and the choices they make are why I continually find myself drawn to this type of literature and why I watch the show. It doesn’t hurt that Norman Reedus is smoking hot! Last night’s episode was a great example of storytelling through the use of conversation. The backstory of the Dixon brothers could have been shown via flashbacks, as so often depicted in TV, yet the writers chose to unfold their personal drama with carefully worded imagery. It was painful to watch, yet beautifully played out. I don’t want to spoil the show for anyone who has not watched it yet, so I will only add that many of the characters resolved conflicts and divulged secrets all through the magic of conversation; that is until the last few minutes of the show, then all hell broke lose and the usual carnage ensued. But, because of the dialog, it is my favorite episode to date. This morning I read a blog post by a TV critic who blasted the show because of “all the talking the Dixon brothers did”. The critic whined that there was too much talking and not enough action. That the brothers showed their true colors through words and action, was lost on her. She had no appreciation for the power of speech. This got me thinking; would she have posted a negative review on Shakespeare’s Henry V play? With dialog like this, you don’t need to witness what Henry’s army will do in order to win the town of Harfleur and those like it. Shakespeare allows us to imagine what invading armies are capable of, once let loose. The entire play is like this, there is no need of battle scenes or of the dead and wounded; the words the characters use tell us a compelling war story. It’s ironic that movies based on Henry V do show the battles, as if modern audience could not comprehend a war movie with out them. I think today’s movie and TV audiences require too much action, they don’t know how to allow words to be the action. I can only imagine what the whiny Walking Dead critic would say about Shakespeare writing a war play without depicting actual war. You make really interesting points about the power of words and their usage. I think TV and film audiences are being trained regarding what has merit/what doesn’t/ what is interesting. Very few have their own thoughts anymore and it’s getting worse.. I agree. I feel we are being dumbed down by the all of the “action” we are fed. Our brains are no longer engaged much when viewing the screen. Give me a good movie with a plot that centers around words, not gore and constant action. Excellent article on the old adage (from the Great War? the Boer War?) “Jaw, jaw, jaw, not war, war, war”. The only real lesson that aggression teaches us is that violence begets more violence, as the great Jacobean revenge plays portray and all history demonstrates. Interesting you mention the BBC’s The Hollow Crown and the inherent lack of a need to stage battle scenes in Henry V: our son Cameron (http://www.imdb.com/name/nm2949446/?ref_=fn_al_nm_1) was the principal grip for Henry V, much of it on location for the … battle scenes. His IMDb entry only mentions some of his recent work; for example, he’s worked on some of the BBC Merlin episodes and is about to work on some Doctor Who (possibly the 50th anniversary programme, featuring the new Doctor, Peter Capaldi). Despite the action he’s involved in filming he’s rather a gentle giant. Oh how wonderful for Cameron! The stories he must tell. Now here is someone who must really love his job. Didn’t the RSC just do an outdoor production complete with battle scene? Now that would be a play to behold! 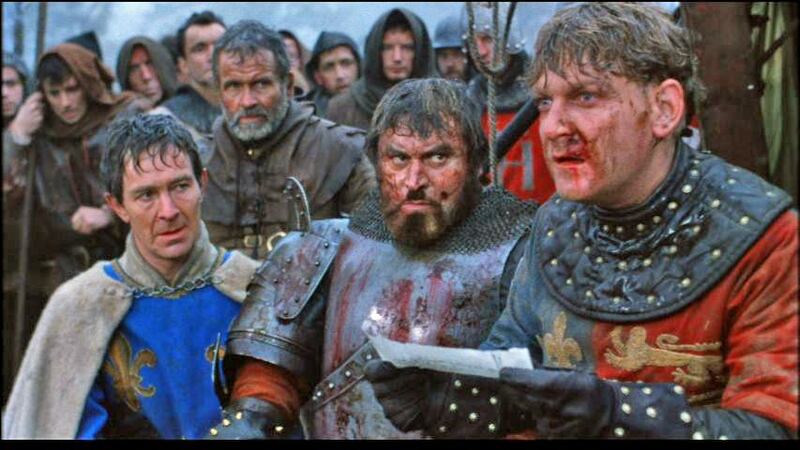 I would rather the film did not include the battles as they may weaken Henry’s speeches. But than again maybe not. Maybe it is good to not only hear the words that inspire men to battle, but to see the effects of them. We will see what the critics have to say; I may end up doing a piece or two on it. I have to say, pacifist that I am (in spirit, anyway) that the sight of the steadily accelerating massed cavalry in the climactic scene of Olivier’s Henry V was a sinew-stiffening and spirit-raising sight to behold. I’m sure the men of Rohan charging the armies of Sauron in Peter Jackson’s The Return of the King must have been partly inspired by that sequence.